At the end of “Chapter Seven,” Barry was either headed for a fall or had already fallen off. He had just murdered Chris, an innocent Marine buddy who had the unfortunate luck of tagging along in a suicide bum-rush hit job from which he and Barry only nearly escaped. He had delivered his one line in the Shakespeare showcase with surprising intensity because he was in the middle of a mental collapse. Sally cheerfully confirms to Barry that his “process” requires him to return to that place of anguish again and again to draw on inspiration. The hitman path will only bring further pain and acting seemingly requires him to rely on that pain. It’s a no-win situation for ol’ Barry, a man who just wants to escape but is ill-equipped to do so. But then, about halfway through “Chapter Eight,” something improbable happens. The world conspires to give Barry the fresh start he so desires. A series of betrayals and misunderstandings provide him an out that he never saw coming. In the world of Barry, this counts as something close to a miracle. Meanwhile, NoHo Hank, after being chewed out by Goran for his supposed weakness, makes the decision to sell out his boss and inform Barry that he should run. 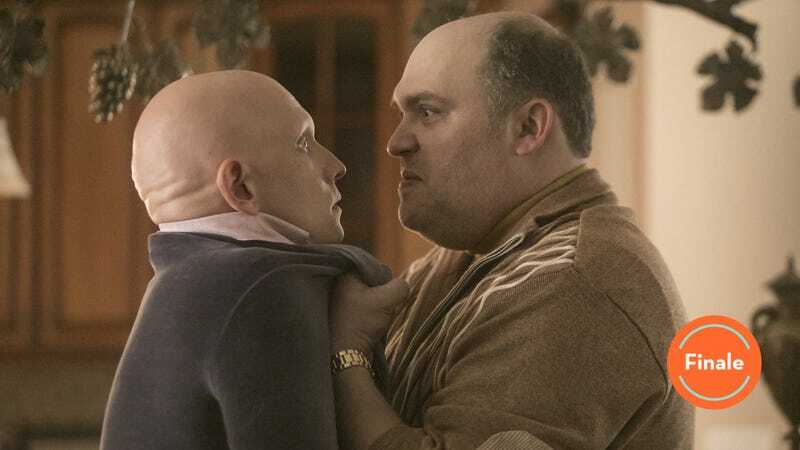 After all, Goran and the Chechens will not stop tracking Barry until he’s dead, so his best move would be to “fly like Bugs Bunny in Space Jam.” Anthony Carrigan has been a stellar comedic presence for the past eight episodes, but he’s mostly taken a backseat to the majority of the proceedings. In the end, however, it’s his bone-deep politeness that ultimately ends up saving Barry’s life. NoHo Hank values honestly and kindness in business, something Goran could never wrap his head around. For whatever reason, he sees a kindred spirit in Barry. “You are super good guy,” he tells him sincerely, and Barry, despite being in the midst of a deep depression, takes it to heart. Except Barry doesn’t run. He makes the logical move, which, unfortunately, is also the move that he never wanted to make again. He returns to Goran’s house and kills Goran, Ruslan (who was in the process of building stocks for Fuches’ prolonged death until Goran put an end to it), and two more assailants. Barry saves Fuches’ life for no other reason than he was still alive when he arrived. NoHo Hank and the rest of Chechens escape the house just before the LAPD arrives with search warrant and backup in tow. Detectives Moss and Loach arrive just after everyone has been found dead, and, after confirmation that the shooter was either “crouching or extremely short,” they conclude that the Bolivians were behind the hit. So there it is. In a press conference, the LAPD announces that the criminal mastermind Ryan Madison, along with Taylor, was trying to pit the Chechens and the Bolivians against each other for their own material gain. (You know, like Kurosawa movie Yojimbo.) Gene reconnects with Moss after the investigation concludes. 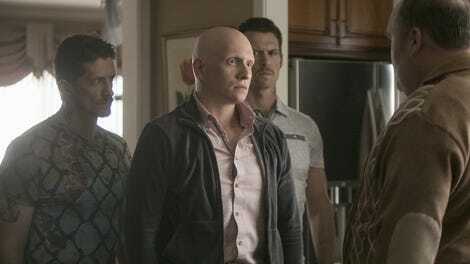 NoHo Hank and Cristobal join forces to create a combined gang. Barry goes to tell Sally that he’s going to quit acting, but she convinces him to stick with it after a brief tale about her violent first marriage. Barry and Sally decide to put on Ben Hecht and Charles MacArthur’s hit comedy The Front Page, the inspiration for Howard Hawks’ His Girl Friday, which will give Barry a chance to work in a lighter register. All seems well in the world. Cut to a few months later. Barry and Sally have rekindled their relationship and are running lines at Gene’s vacation home. Janice has gotten back with Gene, and they’re also spending time at the home. Gene cooks dinner and lip-syncs to Harry Belafonte’s “Jamaican Farewell.” Everyone is in love. Domestic tranquility has taken over the lives of these four previously lonely people. Tumult has subsided. Life has reached a normal pitch. But, obviously, they’re not, and Janice never backs down from that fact. Berg and Hader always sympathize with Barry, but they never make excuses for him. He was a murderer who was willing to kill for money and to escape capture. He might have been manipulated, but he always pulled the trigger. “Just following orders” doesn’t even remotely fly here. Berg and Hader clearly believe the character has the capacity for change, but they also know that any just society would treat him like the mass criminal that he is. Barry has walked that dangerous tightrope with aplomb, but as Janice walks Barry back to the house, it almost seems like the proverbial jig might be up. Then we see that Barry has taped a gun to a tree, and Hader, still providing career best work, gives the saddest look to Janice imaginable. He begs her to not go down this road, but when she insists that she must, shots are fired. We see them from the perspective of the guest bedroom window, with Sally fast asleep. Janice might be dead, but we don’t know. All we see is the sunrise and Barry return to bed in nothing but his underwear. He takes a shower and gets back into bed. Sally, still half asleep, curls up next to him. With his eyes open, he announces to the world, yet again, “Starting…now!” The screen goes black, but we know that there’s no starting over now. Secrets will only compound and the lies will only become more complex. This is Barry. This is who he has always been. NoHo Hank is definitely the series MVP. When he tries to reason with Goran about Barry, he tries to use Space Jam as an entry point (“You know the song ‘Fly Like an Eagle?’ Performed by Seal on the Space Jam soundtrack?”), and he forces the Chechens to mingle with the Bolivians after they join forces (“They’re small but they’re friendly! Mingle!”). Detective Loach tries to pump him and Moss up by playing “Ride of the Valkyries” a la Apocalypse Now. He accidentally picks “Flight of the Bumblebee” instead. In a perfect Sally move, she expects Barry to reveal his past after she vaguely tells him about her first marriage. Barry doesn’t comply. Barry tells Janice that he and Sally will trade off roles every night in an upcoming production of Edward Albee’s The Zoo Story, a la Philip Seymour Hoffman and John C. Reilly in True West on Broadway. “So you’re expecting people to come multiple times?” she asks with genuine concern. Sally is convinced they will. Barry isn’t sure. Thanks for reading and commenting for the past eight weeks. See you next season!